Matthew Mitcham is still in his 20s (about to turn 27 in early March) yet already he has packed an inordinate amount into his short life – from the highs of winning Gold with the highest single-dive score in Olympic history to the lows of depression and drug addiction. It’s all great grist for the mill in his debut cabaret show Twists & Turns in which he tells his story with disarming honesty. He begins the show with his ukulele, singing Pink Martini’s Sympathique, one of his mother’s favourite songs. From there he takes us on a journey through his rollercoaster life: a decidedly unorthodox upbringing with an alcoholic single mother, his achievements as a junior world champion on the trampoline leading to diving, his famous Gold Medal win at the 2008 Beijing Olympics, his struggle with self-esteem, his descent into depression and drug addiction, and his emergence into the light after realising that he needed help. (He is now training to compete in Rio). Mitcham came out before he competed at Beijing and has become a gay icon and a role model for many young men. Performing in Sydney as part of the 2015 Mardi Gras festival, the opening night audience took him to their heart from the start and were clearly touched and entertained by his story. It’s fair to say they welcomed seeing him in his bathers too. Twists & Turns premiered at the 2014 Perth Fringe World festival and has toured widely around Australia. Directed by Nigel Turner-Carroll, Mitcham is joined on stage by cabaret artist Spanky (Rhys Morgan), in trademark trash-drag with long purple wig, who plays Mitcham’s imaginary childhood friend and gives voice to his inner demons. Spanky also sings backing vocals along with musical director Jeremy Brennan who did the impressive musical arrangements and provides dynamic accompaniment on piano. The show features an eclectic selection of well-chosen songs among them Alanis Morrisette’s Perfect, the Spice Girls’ Too Much, New Order’s True Faith and Rufus Wainwright’s Go or Go Ahead. Mitcham isn’t a natural born showman, telling his stories with a straightforward nonchalance and the kind of even-handed calmness he has doubtless had to develop as a diver. But he has genuine charm, winning you over with his endearing honesty and cheeky, throwaway sense of humour. Having Spanky there adds a colourful dimension to the show and a trampoline routine gives us a taste of the physical poetry he brings to diving. As for his singing, Mitcham’s voice has a warm, pleasant tone and he interprets the songs with tangible emotion. In a musical highlight, he sings a haunting version of Nick Cave’s Little Water Song, which is beautifully lit and very touching. There are a few clunky movements in the show. The opening section with voiceovers by his mother feels a bit awkward as does a bit of audience participation but overall Twists & Turns is an impressive cabaret debut and an inspiring, entertaining show. Well worth a look. When it comes to slashie careers, Olympic diver/cabaret artist is one of the more unusual ones. For Matthew Mitcham, the leap from the diving board to the stage began with the ukulele. “I had to take three months of bed rest because I had stress fractures in my spine,” says Mitcham, who famously won gold with an unprecedented perfect score at the 2008 Beijing Olympics. Ever the perfectionist, Mitcham spent hours fine-tuning his playing and during the 2012 London Olympics posted video clips on YouTube of him playing Beyonce’s Single Ladies and the Family Guy theme tune from his room in the Olympic Village. To his surprise they went viral. Musical director Jeremy Brennan saw them and invited him to play in a couple of cabaret nights at Sydney’s Slide Cabaret. “From there the Melbourne Cabaret Festival invited me to MC and perform at their closing gala in 2013 and the producers were so impressed that they asked me if I would consider turning the book (his revealing 2012 autobiography Twists and Turns) into a cabaret show,” says Mitcham. They put him in touch with Rhys Morgan (aka cabaret artist Spanky) to help write the show and director Nigel Turner-Carroll, while Mitcham approached Brennan to be involved as musical director. The resulting show Twists & Turns premiered at the 2014 Perth Fringe World Festival where it won Best Cabaret and has since toured widely. Mitcham is back on the road with it again now. After selling-out in Melbourne, he plays Brisbane and Perth before winding up in Sydney at the end of this month to perform as part of the Mardi Gras Festival. Mitcham, who turns 27 next month, has quite a story to tell. Behind his Olympic triumphs, the openly gay diver – who was brought up in Brisbane by an alcoholic single mother – was struggling with low self-esteem, depression and drug abuse, including crystal meth addiction. As he did in his autobiography, he discusses all this in his show with an unflinching, winning honesty. He is equally forthcoming in an interview situation, replying openly and straightforwardly when questioned but without it ever feeling like he is grandstanding or dramatising. Nor does he seem remotely bitter. “I’ve had really good experiences with being very candid in the public spotlight with the coming-out just before Beijing,” he says. “That was received so well by the public and handled so well by the media, (I received) just unanimous support. That was really heart-warming and gave me the confidence that I could be vulnerable with the public and the media and that I would be held and supported. So when it came to writing the book, I was a bit more comfortable to be as candid as I was,” he says. Mitcham admits that at the last minute he got cold feet and almost deleted the darker, more confronting material but finally decided to go ahead. “I’m so glad that I did it, because it opens up a dialogue and it gives people permission to be able to share their stories. I’ve had a lot of people share their stuff with me after the show,” he says. Mitcham certainly seems to be happy. Despite a decidedly unconventional upbringing and some seriously troubled years, he now appears centred and levelheaded – though he admits to a pathological need to be loved. He is still diving, having won silver and gold medals at the 2014 Commonwealth Games, and he is in a settled eight-year relationship with Lachlan Fletcher who tours with him on Twists & Turns, looking after “logistics” and merchandise. In putting the show together, Morgan wrote a first draft, which he and Mitcham discussed. “We got up to about four or five drafts before we knew the show well enough to stop using it,” says Mitcham. Morgan – in his trash-drag Spanky guise – also features in the show, personifying Mitcham’s childhood invisible friend and his inner demons, as well as singing backing vocals. The show also includes a trampoline (Mitcham was a trampoline gymnast before he began diving, winning an event at the 2001 World Junior Championships), an eclectic selection of songs, and some pre-recorded voiceovers by his mother Vivienne (who he describes as “nuttier than a bag of trailmix”). One of the stories Mitcham tells is spending six months without electricity as a five-year old when his mother had an argument with the electricity supplier. During this time, she bought a wind-up gramophone on which they used to listen to old records. His mother was certainly eccentric, I suggest. “That’s the diplomatic way of putting it,” says Mitcham with a laugh. “But she has given me some fantastic anecdotes to tell in the show. Mitcham says that his mother likes the show. “She was even quite supportive of everything I put in the book because it is my story and she’s at peace with all that stuff from my childhood. She knows she could have done things better but we both know she did the best she could at the time. She’s done a lot of work on herself since, in the last seven years or so. She’s gotten sober as well and done a lot of personal development. She’s been diagnosed with Asperger’s and stuff so she’s working on those kinds of behavioural things as well. “Before the book came out I gave her the manuscript because I was kind of worried about how she might feel about it all and after she read it she said, ‘Oh God! I thought you were going to be so much harsher than that, you could have been, I wouldn’t have blamed you.’ I think she’s a lot harder on herself but she is forgiving herself,” says Mitcham. The songs in the show are well-chosen and include Irving Berlin’s Blue Skies, Pink Martini’s Sympathique (one of his mother’s favourites), Nick Cave’s Water Song, the Spice Girls’ Too Much and New Order’s True Faith among others. Brennan also uses some Erik Satie and Philip Glass as underscoring. Another telling song choice is Alanis Morrisette’s Perfect. “I felt there was no way we couldn’t have that in the show because it is perfect. It basically tells my story,” says Mitcham. As for his singing, it has developed steadily since he began performing due to “hours and hours of practice” with Brennan. Having contemplated retirement after the London Olympics, and again after the recent Commonwealth Games, Mitcham is still diving – for now. “I’ve been on reduced training since the Commonwealth Games because I have been trying to rehabilitate an injury,” he says. “I tore a tendon in my elbow. I was dealing with that all last year. I got to the point where I had achieved everything I wanted to achieve in sport (having won a gold medal) at the Commonwealth Games so I’m just about ready to let the sport go but I’ve been talked into staying until (the Olympic Games in) Rio, which I’m OK with. But my condition was that I want to be injury free before I begin ramping up the training again. The move from diving into cabaret wasn’t actually such a big leap, says Mitcham. “I think I’ve always been a performer, a show pony. If you were going to psychoanalyse it, it would be searching for validation and positive reinforcement. They way I was discovered diving was because I was at the Chandler Aquatic Centre in Brisbane – which is one of the national diving centres but used to be open to the public – and everyone was doing bomb dives. If you want to see some exhilarating tap dancing then look no further than The Tap Pack. Jesse Rasmussen, Jordan Pollard and Thomas J Egan created the show as a vehicle for the tap-dancing prowess of themselves and their fellow performers Ben Brown and Christopher Horsey – and on this front it certainly delivers. But even though the production has been in development for a while now, and had performances last year, the story they have written as a framework for the dancing still needs work. 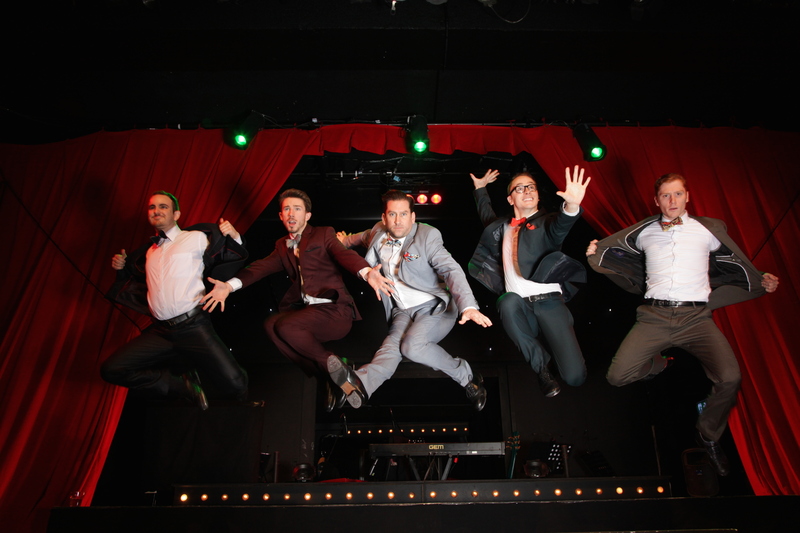 Directed and co-created by Nigel Turner-Carroll, The Tap Pack opens with cocky Aussie busker Blue (Rasmussen) doing his thing to raise the funds to get to New York and meet his idols Fiveplay, a Rat Pack-style act he dreams of performing with. Rasmussen quickly has the audience clapping along. In New York, Blue encounters Fiveplay, now reduced to Fourplay (yeah, we get it). Led by the hard-drinking Marty (Horsey), the sole surviving original member, the act is well past its use-by date. Blue could help them reboot their show, the other boys are excited, but Marty is resistant and, well……. you know how it turns out. The plot is slight, the characters are fairly under-developed and the story is corny and predictable, with some silly sight gags involving a chain saw and some goggles as well as some slightly blue humour. There’s the germ of a great show here. The boys have plenty of charm and they can certainly dance, they just need a sharper, wittier script. However, with a six-piece band led by musical director Michael Dench on keyboards, the music is hot and Brown delivers some strong vocals. But it’s the tight, terrific dancing that really kicks The Tap Pack over the line. The show ends on a high as the boys bust out their best moves to finish with a spectacular, extended tap routine that sends the audience home happy. Fantapstic!